Do you know which of your behaviors most get in your way? Do you get help from your trusted friends and colleagues in your personal and professional development? 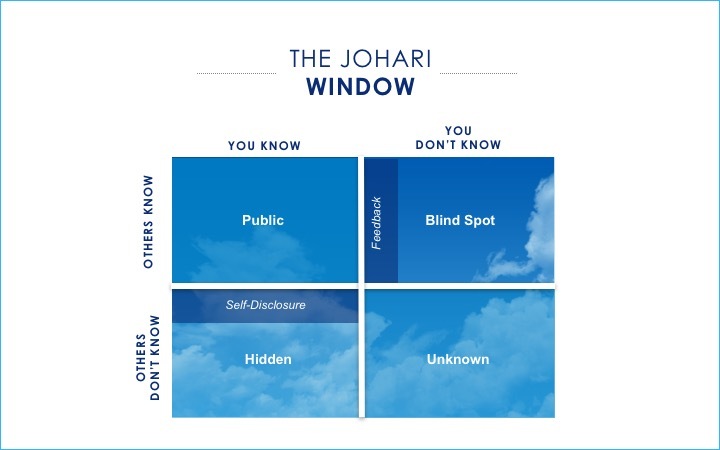 The Johari Window is a model that illustrates, in a very simple manner, how you can leverage the power of others to accelerate your own growth and development. Let’s see how it can help you. (1) ‘Public’ / ‘Open’: things about you that both you and others are aware of. (2) ‘Hidden’ / ‘Façade’: things about you that you are aware of, but others are not. (3) ‘Blind Spot’: information about you that you are not aware of, but others are. (4) ‘Unknown’: information about you that neither you nor others are aware of. Are you familiar with the concept of a blind spot when driving? These are certain places around our vehicle that are not visible to us in our mirrors at a given moment in time. Awareness of blind spots is key to being a better driver because we will look more intentionally to see what’s there (e.g., before switching lanes). To accelerate your personal development, it will serve you to proactively identify those self-limiting behaviors that are in your blind spot. Ask an open-ended question such as “I’m curious. If you were to encourage me to shift one thing about my behavior so that I could be more successful, what would that be?” Give people time to consider this instead of expecting an on-the-spot response. Show them a list of common self-limiting behaviors (here’s a list from my prior blog) and ask them to highlight any that they see in you. In seeking out this information, you are effectively “expanding” your Public quadrant while shrinking the size of your Blind Spot quadrant (see image below). This increases your awareness of how you are perceived by others. The Johari Window framework not only helps you to identify behaviors to work on, as described above. It also illustrates a simple approach to working on those behaviors. You can further accelerate your personal development by disclosing what you are working on with trusted individuals that can provide you with feedback on how you are doing. For example, let’s say you’ve learned of a blind spot around how much “space” you take up in meetings. You decide you want to work on speaking less and listening more. But don’t stop there. Tell a few close colleagues about this, and ask them to observe you and give you feedback. Their help will make it more likely that you’ll shift your behavior…and faster. 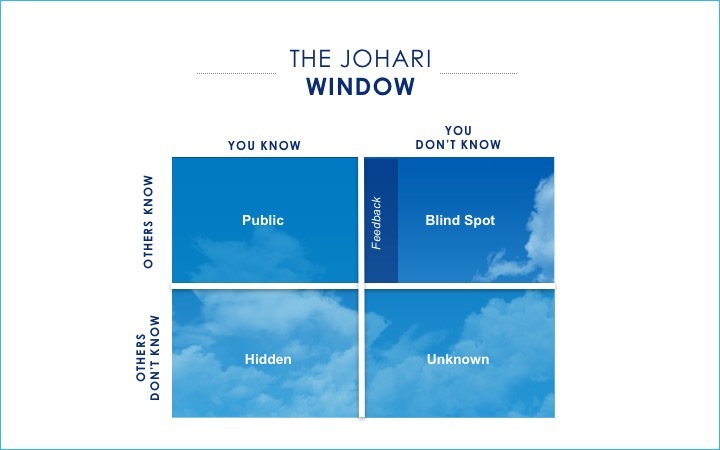 You can expand the Public quadrant horizontally, reducing your Blind Spot quadrant, by soliciting feedback from people you trust. You can expand your Public quadrant vertically, reducing your Hidden quadrant, by disclosing your development areas to trusted individuals. It’s your career. It’s your life. Be discerning on when/how to leverage the power of others to accelerate your own growth and development.